This is one of the most widely recognized maps of Ireland by Gerard Mercator. Presented with a westward orientation this map is soaked with intricate detail. Mountain ranges engraved to display their varying heights fill the map along with streams rivers forests and lakes (lough). Nearly every town within the country at the time is noted from the smallest villages to the major cities of Waterford and Dublin which are of the same size when this map was first produced. Surrounding the island are examples of Mercator's masterful calligraphy set within a speckled ocean. The top right corner features a banner style title cartouche that so simplistically and elegantly adds to the aesthetic qualities of the work. 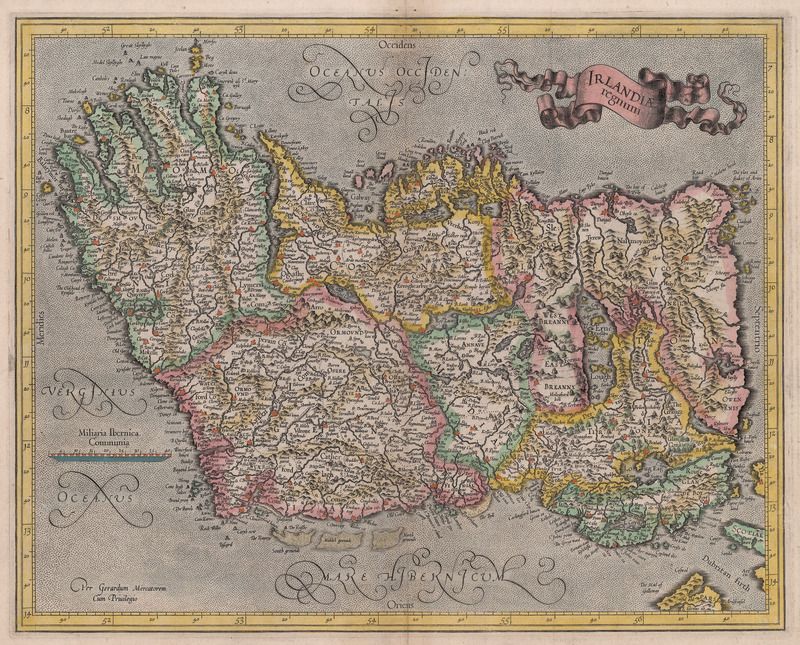 An excellent addition to any Mercator or Ireland map collection. Latin text on verso. Condition: Map is in A condition with backing paper on the verso from previous framing.